Lewes’ unique torch-lit tribute to its World War I dead, staged last November, is the subject of a new film to be premièred at Depot cinema. The 15 minute film, shot by four professional filmmakers from Lewes, documents the moving act of Remembrance organised by the Edward Reeves Archive Project. 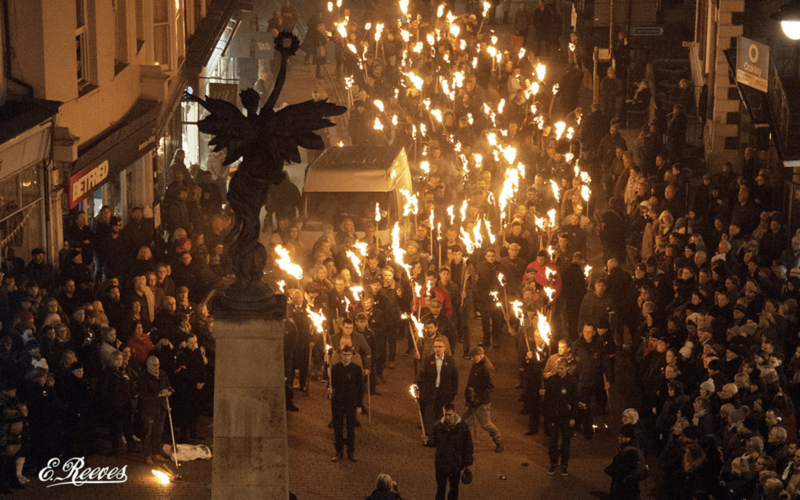 The event involved nearly 500 volunteers with the support of all seven Lewes Bonfire Societies and Lewes Town Council. At dusk on Remembrance Sunday last year, volunteers matching in age to the 236 casualties named on the Lewes War Memorial walked from the home address of the fallen to the memorial, carrying a flaming torch. They stood, cordoned by a ring of 100 women representing those left behind. As each casualty’s name, address, cause and date of death and age was read out, the volunteer stepped forward, doused their torch and disappeared into the crowd. The film, directed by Tony Dowmunt and Mick Hawksworth and produced with the backing of Lewes Community Screen, will be shown at Depot Cinema, Lewes from Monday (5th). It forms the centrepiece of an exhibition in the Depot studio featuring a selection of photographs from the Edward Reeves Archive. Facsimile copies of the original information sheets filled in by relatives of those commemorated on War Memorial, erected in 1922, will also be on display. Screenings take place every 20 minutes between 5pm and 7pm on Monday to Friday (not Tuesday), and between 2pm and 6pm on Saturday and Sunday. The exhibition is open between 10am and 7pm each day (except Tuesday). Admission is free.